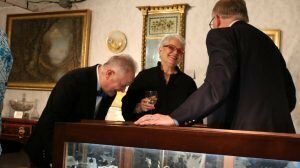 This year, Woodlawn celebrates 13 years of hosting the Ellsworth Antiques Show and you are invited to experience the excitement at the Opening Night Party. Presenting sponsors for the evening are Skinner, Inc. and Boston Private. The evening begins with a Cocktail Party and ticket holders will enjoy delicious hors d’oeuvres and fine wine while admiring select antiques and decorative arts offered for sale by dealers of local, national and international renown. After the Party, stay and enjoy the festive Opening Night Dinner catered by Chippers Restaurant. Seating is limited to 75. Cocktail Party tickets are $50 per person ($90 per couple) and Cocktail Party/Dinner tickets are $135 per person ($250 per couple or $650 for a table of 6). Purchase your tickets online today! Check back soon for the Opening Night Cocktail Party and Dinner Menu! Learn more about the Ellsworth Antique Show or call Woodlawn at 207/667-8671. In addition to the program fee, a $1.50 processing fee will be added to all credit card transactions.